To fully understand the Mexico-United States border, one needs to understand the history of the people who have called this area home for centuries. The Sonoran Desert and its surrounding areas are hard places to live, however a few Native American tribes were able to sustain themselves here. As the United States spread west and Mexico became established to the south, a border was formed in Native American homelands, and these people have since been heavily impacted by borderland culture and territorialization. The content that follows will focus on two tribes whose existence was uniquely impacted by the border, within the time frame of 1848 to 1916. The Yaqui spent decades keeping the Spanish out of their homelands. Following Mexican Independence from Spain in 1821, it was the Mexicans that the Yaqui were fighting to keep out of their territory. “In 1868, 600 Yaqui men, women, and children were captured near Vahkom Pueblo by Mexican state and federal troops. Their arms were taken, and 450 were locked in a church. During the night, the church was shelled. 120 of the people inside were massacred.” This did not deter the Yaqui from continuing to believe in their autonomy and to fight for their homeland. The Mexican government continued to have conflict with the Yaqui and began deporting captured Yaqui members from their homeland to various Central American locations. “Significant Yaqui relocation occurred from the United States to Sonora and from Sonora to the United States during the 1880s. In 1897, a peace treaty was signed at Ortiz, Sonora between the Yaqui people and the Mexican government.” After two years of peace, fighting returned and would sporadically continue through the middle of the Twentieth century. 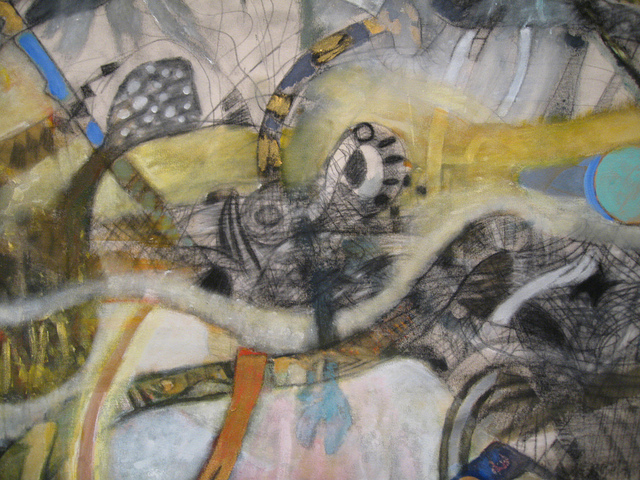 The Yaqui represent a unique perspective history of the borderlands. Often, when studying Native American relations we focus on how the United States government treated these people, not the Mexican government. The next group of people we will take a closer look at is the Tohono O’odham. The Tohono O’odham have maintained a large presence in the Sonoran Desert area and beyond. The land that these groups of people have inhabited for so long is called the Papagueria. The southern border reaches Sonora, Mexico. The northern border reaches nearly to present day Phoenix. 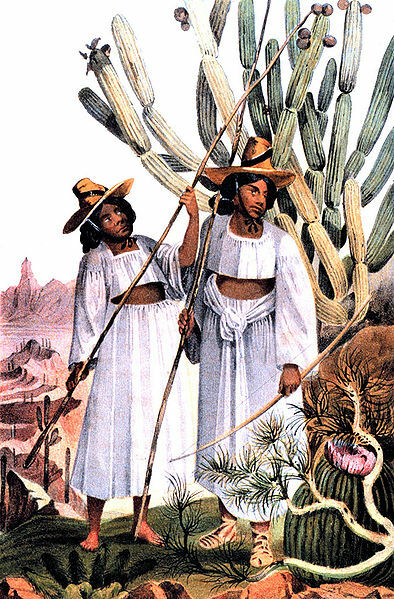 Tohono O’odham women collect saguaro fruit from the Organ Pipe cactus using long poles called kuibits. The Pascua Yaqui and the Tohono O’odham are often overlooked by a general study of history. However, each of these Nations had a very unique existence and history in the borderlands. First, the Yaqui fought with the Spanish and later the Mexican government for decades to protect their culture and more importantly their land. Historians frequently tell stories of conflict with Native Americans and the United States government, but rarely do we get the perspective of the Yaqui. Next, the Tohono O’odham had their land split by the border created by the Gadsden Purchase in 1853. The border made it impossible for the O’odham to freely travel within their native lands. In conclusion, the border alienated both of these Native American tribes due to high demand for the land they inhabited for centuries. “Yaqui History.” Pascua Yaqui Tribe of Arizona. http://www.pascuayaqui-nsn.gov/index.php?option=com_content&view=article&id=30&Itemid=14 (accessed April 17, 2012). “History & Culture.” Tohono O’odham Nation. http://www.tonation-nsn.gov/history_culture.aspx (accessed April 14, 2012). “Tohono O’odham rarely show up in AZ history books.” Arizona Daily Star. http://azstarnet.com/special-section/old-west/article_7594ec8c-4926-5b0a-aa85-2abd767ba6e9.html (accessed April 14, 2012).